I grew this purple broccoflower this year. I bought cauliflower. I grew broccoli. The only thing that resembled cauliflower was the total lack of side shoots. This tastes good but not good enough to grow next year. 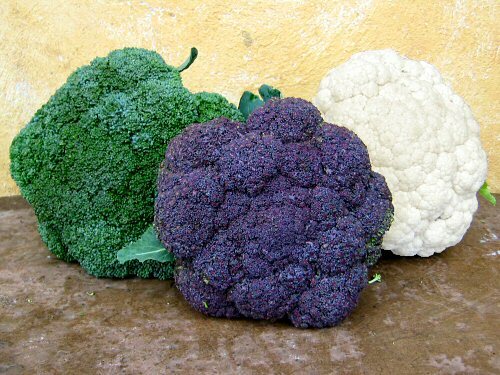 Whether its Broccoli or Cauliflower, I like the looks of it. Your picture is great! I will look for Violet Queen to grow next year. My kids would love it! Thanks for sharing such an odd but interesting variety. I just bought one yesterday and I cooked it for tonight’s dinner. My boy likes the colour but we would like to know how the purple colour comes from? Sarah, veggie colors come from pigments. It’s all genetics, like different colors of hair or eyes or skin or whatever. You can try searching in Google or Yahoo! for something like “vegetable color nutrition”. Here are a couple of interesting links: Colour is the key and Benefits of a Variety of Fruits and Vegetables. how do you keep your cauliflower and kale free of cabbage worm? ours are decimated by cabbage worm. I have been growing cauliflower for years. Use BT It is a natural product and is considered organic not a poison Spray plants about every 10 days. eilenn: Thankfully, I haven’t been visited by cabbage worm, so I don’t have an answer. Flea beetles are the scourge of the brassicas here, I absolutely have to use floating row cover over seedling transplants or the FBs would eat them to the stem. I had to do a project on cauliflower, I learned a lot of good information about it. These are the questions to answer to get awesome info. The nutritional value,Preparation,What part do we eat,History,Grown and harvested, And recipes. The best place to go is fruitsandveggiesmatter.gov. Then click on fruit and veggie of the month scroll down and click on cauliflower and there is all the info you need. It makes for a stunning photo, whatever you want to call it! BT bacillus thuringiensis, is what i use for white cabbage butterfly larva same as cabbage worm ??? also very very effective and beautiful is Phacelia and buck wheat as and intergarted pest management system a row along side my brassicas attracted hover flys that parasited all the bests i had for a whole season wide the breadding stock out completley. beetles are what got your pak choi as well i read, hmm mine as well similar signs will try covers but so expensive. Broccoli is high in vitamin C, as well as dietary fiber; it also contains multiple nutrients with potent anti-cancer properties, such as diindolylmethane and small amounts of selenium. A single serving provides more than 30 mg of vitamin C and a half-cup provides 52 mg of vitamin C.The 3,3′-Diindolylmethane found in broccoli is a potent modulator of the innate immune response system with anti-viral, anti-bacterial and anti-cancer activity.Broccoli also contains the compound glucoraphanin, which can be processed into an anti-cancer compound sulforaphane, though the benefits of broccoli are greatly reduced if the vegetable is boiled.Broccoli is also an excellent source of indole-3-carbinol, a chemical which boosts DNA repair in cells and appears to block the growth of cancer cells.